Republicans who demonize the press as the enemy are encouraging violence against reporters. Thus far, Donald Trump’s presidency has been characterized by a series of crises. His campaign is under investigation for its ties to Russian agents; his Muslim ban has been blocked by the courts; his health-care legislation is being rewritten by the Senate; and his forays into diplomacy have embarrassed the United States and its allies. But as we lurch from scandal to scandal, let us not lose sight of the fact that we are witnessing a dangerous, sustained, and increasingly violent assault on the free press. On May 24, The Guardian’s Ben Jacobs approached tech multimillionaire Greg Gianforte, the Republican candidate for Montana’s seat in the House of Representatives, to ask his position on the American Health Care Act after the Congressional Budget Office determined that it could strip as many as 23 million Americans of coverage. Instead of answering the question, Gianforte slammed Jacobs to the ground and broke his glasses. Later that night, his campaign issued a statement claiming that Gianforte had been attacked by a “liberal journalist.” The next day, he won the special election. There appears to be no political price to pay for violence, as long as it’s committed by someone like Greg Gianforte. Before the incident, Gianforte and outside groups had vastly outspent his Democratic challenger, folk singer Rob Quist, and as many as half of the votes had already been cast by mail. 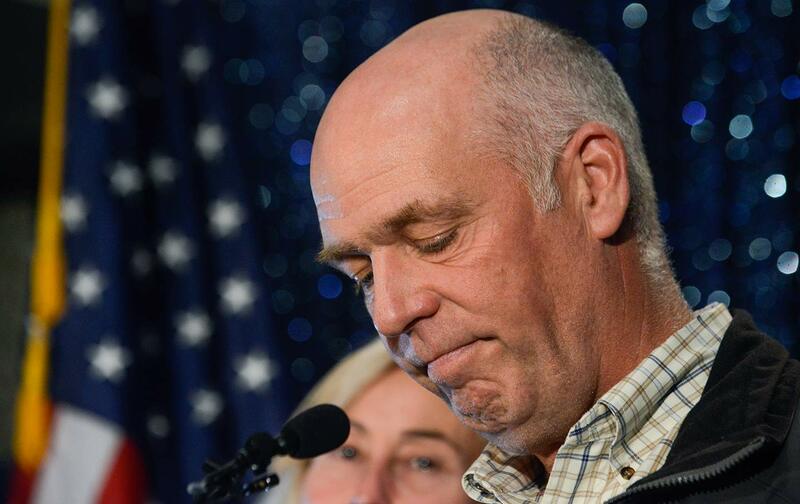 But it remains deeply disturbing that a candidate who physically assaulted a reporter is now headed to Congress—and also that, in the 24 hours following the attack, Gianforte’s campaign raised almost $100,000. For a certain section of the electorate, it would seem, violence against the press isn’t a disqualifier in a congressman; it’s a bonus. After an audio recording emerged that corroborated Jacobs’s account, and after Fox News reporters who were present also confirmed it, the Gallatin County sheriff cited Gianforte for misdemeanor assault. That didn’t stop Vice President Mike Pence from congratulating Gianforte on his “great win,” adding that he looked forward to having him “Make America Great Again.” The president himself was abroad during the election, but he took time on his first day back home to tweet that this was a “Big win in Montana for Republicans.” Perhaps the most candid assessment of the administration’s position was offered in a tweet by Grover Norquist: “Congratulations to tax pledge signing Greg Gianforte who just body slammed tax hiking Democrat pol.” In plain English, this means that violence against the press is fine, as long as it results in tax cuts. During his campaign, Trump regularly called the media fake, biased, dishonest, unwatchable, distorted, and inaccurate. What happened in Montana isn’t an isolated case. In Washington, DC, last month, another reporter was manhandled by security guards at the headquarters of the Federal Communications Commission. (The FCC has since apologized.) In Charleston, West Virginia, a journalist trying to ask Health and Human Services Secretary Tom Price a question about preexisting conditions was handcuffed and arrested. And in Lexington, Kentucky, the windows of the Herald-Leader were shattered by possible gunfire. It’s not just physical violence that reporters have had to face: Increasingly, their access is being restricted as well. During his trip to Saudi Arabia, Secretary of State Rex Tillerson held a briefing at which no American reporters were present—because they were never told about it. Before that, Trump granted access to Russian state media for his meeting with the Russian ambassador, but the American press was snubbed. And in April, the White House decided it would keep its visitor logs secret, reversing an Obama administration policy. This antagonism toward the press has been preceded by months of vilifying rhetoric. During his campaign, Trump regularly described the media as “fake,” “biased,” “dishonest,” “failing,” “unwatchable,” “distorted,” and “inaccurate.” At his rallies, he kept the press in a designated pen and encouraged his supporters to heckle them. In October, he started accusing the media of rigging the election. By February of this year, he declared that the media were enemies of the American people. No doubt these officials would say this is just humor—“Lighten up, liberals!” And no doubt they would dismiss what happened to reporters in Montana, Washington, and West Virginia as nothing more than isolated cases. But those of us who come from parts of the world where reporters are threatened, harassed, jailed, or murdered find neither humor in the jokes nor justification for the violence. Either the press can, as the saying goes, afflict the comfortable and comfort the afflicted, or it is not free at all. Threats against the free press are threats against democracy itself.